Side view of an AN-M30A1 (100 lb) bomb. The AN-M30A1 (100 lb) is an American general purpose high explosive (HE) bomb. The AN-M30A1 is an air-dropped bomb which utilises a combination of blast damage, penetration and fragmentation during its explosive effect. Typically the general purpose bombs are used when targeting either enemy troops, vehicles and buildings. The AN-M30A1 utilises two types of fuzes to detonate the bomb with the nose fuze which is the main fuze and the one in the tail as a backup. General purpose bombs are aerodynamic in shape and have stabilising fins to enable accurate drop locations when sighted, targeted and released by a bombardier. The aerodynamic effect also benefits aircraft which carry the bombs on external payload pylons. A top view of an AN-M30A1 (100 lb) bomb with identification of parts. This bomb was manufactured in one of three ways, either cast or spun as one piece, cast as two pieces and welded or cast as three pieces and welded. The nose contained a threaded opening which is closed by the fuze-seat liner and the male plug at the tail is closed by an explosive adapter booster. The AN-M30A1 is outfitted with two suspension lugs which are directly welded to the bomb casing 14 inches apart. A single suspension lug is welded to the opposite side of the bomb at the centre of gravity which can be utilised to suspend from British aircraft. An exploded view of AN-M30A1 (100 lb) as found in a military technical manual. 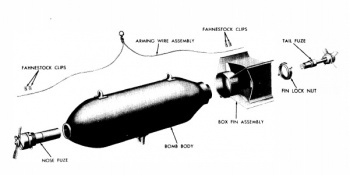 This version of the AN-M30 bomb, the A1 version indicates that a modification which locks the base plate to the central filling via two steel pins, preventing the removal of the base plate once the bomb is filled with its explosive material. Once the adapter booster is inserted, a pin is inserted which prevents its withdrawal. The tail section of the AN-M30A1 bomb is a cast-steel sleeve known as a box-type tail. The Sleeve is manufactured of a cast-steel sleeve with four sheet-steel fins held into place with a locking nut. Each fin is held by a fin-strut which once in place are welded together to make one assembly. Different tail fins were utilised when the low-altitude bombing took place compared to higher altitude bombing. The impact nose fuze is vane operated and delayed armed meaning that when the bomb is dropped, the vane spins, arming the bomb away from the plane dropping it. After arming, the bomb will detonate when the impact fuze comes in contact with an object. Detonation can be set to be instantaneous when the bomb hits something or with a delay, allowing the bomb to burrow into the ground before detonating. The impact tail fuze is also vane armed and can be set to delayed detonation. Tail fuzes are typically used with nose fuzes as a backup detonator in case the primary fails. The AN-M30A1 was painted with a standard colour scheme since 11 March 1942; the body was painted olive drab while yellow stripes were added to indicate the bomb was a HE. To differentiate what type of filler was used, a one-inch yellow band at the nose and tail along with a 1/4 inch dotted band at the centre of gravity of the bomb which indicated it was filled with 50/50 Amatol or TNT fillers. A second yellow band was added to the nose and tail of the bomb if it was filled with Composition"B" which required special handling due to its sensitivity. Standard marking on the bomb body in black paint included type, weight, the name of the bomb, type of filling, lot number, date and place of filling along with the inspector's initials. Indestructible markings of this information were also stamped into the casing before filling with explosives. The AN-M30A1 utilised Amatol as its explosive compound which is a composition of TNT (Trinitrotoluene C7H5N3O6) and Ammonium Nitrate (N2H4O3). Amatol is a British name which comes from the words of the ingredients of this compound, Ammmonium and toluene. Supplies of TNT were limited due to the amount of ordnance needed to be manufactured. Because of the great explosive velocity and brisance of TNT, one-way stretch resources was to exploit TNT's one drawback. TNT in its pure form when detonated leaves a black smoke residue after it explodes due to the oxygen deficiency in TNT (does not fully explode/burn all components efficiently). To supplement TNT's need for oxygen, ammonium nitrate is added to the mixture which has an oxygen surplus and overall increases the energy release of a TNT explosion when mixed. When compared to each other, Amatol has a lower explosive velocity and brisance than pure TNT; however because it was cheaper to use Amatol, it became the go-to explosive for general purpose bombs. The AN-M30A1 (100 lb) is a general purpose HE bomb which was utilised by fighters, attackers and bombers. Due to its size, either one or two could be outfitted to a fighter or attacker allowing it to perform low-level precision bombing on AAA or light vehicles. 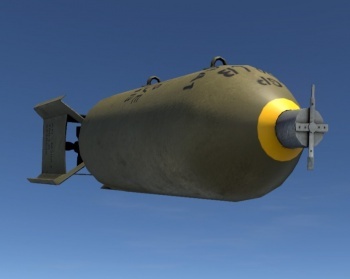 Bombers can carry between 12 to 16 of these bombs and could drop them all in one location bombing a base or could spread them out across the map depending on where the targets of opportunity are. The general purpose AN-M series bombs utilised in War Thunder are classified as "old-series" bombs which consist of a bomb body, fin assembly, fin locking nut, nose fuze, tail fuze, arming wires and safety clips. When possible, to safely ship bombs, the sensitive or fragile components were shipped separately and then assembled before use. This page was last edited on 9 April 2019, at 18:47.